A portable basketball hoop is different from a permanent one with a pole that goes into a cement base to keep it upright. The portable basketball hoops are designed for homeowners or renters who want to have a basketball hoop but be able to move it into different positioned (the back yard, the front driveway) as needed. It’s also so they can be removed, transported and placed in a new home when moving rather than have to leave the permanent basketball hoop where it is already cemented into the ground. Once assembled and fully loaded up with either sand or water, the hoop will weigh a considerable amount. While, yes, it’s still portable, it’ll require an adult to push it and probably a second person to help steady it on uneven ground to prevent the structure from toppling over either into something or someone! Therefore, anyone moving it later must maneuver it slowly to avoid building up momentum and overconfidence to keep everything steadier. To prevent the need to move the assembled and positioned hoop because of a bad thought process with the setup, think very carefully about where you will place the best portable basketball hoop. It will be inconvenient at best and difficult at worse to have to relocate it later because a bad spot was chosen. If necessary, consult each member of the household to solicit their opinion first. That way, the best ideas rise to the top and the bad ideas get rooted out before doing anything more. It’s necessary to have the assistance of at least one adult. They are needed to assist in the assembly and setup of a portable basketball hoop. Some parts have to be assembled and there’s also a need to add either sand or water to the base. This requires adults to lift up the sand bag or provide the water safely. The sand bag is heavier than most young children or teenagers can safely carry without possibly injuring themselves. A number of the component parts aren’t light either and as such, it needs a strong person to lift them into position while another ensures everything holds together. The base is usually hollow and requires either sand or water to fill it up. This makes it more portable once emptied out but requires filling up before usage. The heavier base ensures that the portable hoop once upright should have a secure enough foundation that it won’t topple over even with strong outside winds from a local storm. Do check what parts should be inside the product packaging because assembly. This avoids finding out once half assembled that a necessary part is missing. 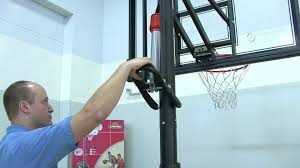 While a basketball company’s customer support can usually send out a replacement (small) part within a few days, it will halt the assembly and setup of the basketball hoop for the time being. Once following these steps, you should be playing basketball outside in the no time. #2 Carleton 85 #7 Calgary 69 – The Ravens go up 10 at the half on a run and pitch trey byEmmanuel Owootoah at the buzzer. Calgary had played hard at the defensive end, causing 12 turnovers, and slowing-down the Carleton drive, kick, and hit the 3 offense. Still, the Black Birds were on top having made 7 treys in the opening 20 minutes, and that is deadly for any defense. With the big rebounding edge for Ravens, Calgary gives up too many extra chances. Calgary hangs in for much of the 2nd half, and, brings the score within 5 points in both the 3rd and 4th frames. But, with about 6 minutes left, the Ravens go on an 11— 0 run to boost it to 16. 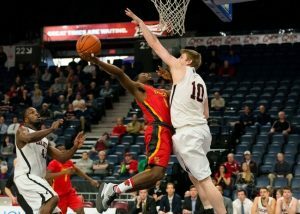 There are 5 Carleton players in double figures, as they shoot 47% as a team vs 42% for the Dinos. The big difference came from outside shooting, as the Ravens hit 14/35 for 42 pts against UC’s 4/14 for only 12. That’s a tough gap to fill …. Rebounding by Carleton did wear down the Dinos, with the final count 48-24, including 17 offensive boards for the defending champs. Carleton had 16 points each from guards Connor Wood, Emmannuel Owootoah, and Kaza Kajami-Keane, with Keane adding 9 assists . Eddie Eyikor scored 10 plus 7 boards, while big Cameron Smyth cashed 10 and grabbed 9 off the glass. Carleton will play in one semi final vs McGill on Saturday, while Calgary goes Friday at 3 pm Mountain in the consolation bracket against familiar foe, the Manitoba Bisons. #3 McGill 63 #6 Manitoba 53 – McGill couldn’t have asked for more in terms of the run of play in this offensively-challenged contest . The Bisons come out looking a little tight, as the McGill defense chokes down Manitoba’s early offensive thrusts. McGill gets a bigger share of the ball, and convert free throws and a pair of late-on-the-clock treys for a 5 point margin after 20 minutes. Manitoba picks up their game late in that 2nd quarter, and look more comfortable at the scoring end for a bit. However, the Bisons ball handlers / shooters are ‘off their game’ for the most part. The Redmen win while shooting just 37% from the floor, and 11 for 22 from the foul line! Just too many sloppy decisions by the Herd. Manitoba cannot get their break going, and take an uncharacteristically low 8 attempts from 3, and hit just 2. McGill is only 6/28 from deep, but still come out ahead in that department. Veteran Redmen, guard Jenning Leung (13 pts) and post work-horse Francois Bourque (13 pts/ 14 rebs/ 4 steals) provide the leadership needed to steer the Reds into the semi-finals. McGill advance to Saturday’s semi-final against the Carleton Ravens, while Manitoba get to play their Canada West rivals, the Calgary Dinos on Friday at 6 pm Atlantic in the consolation round. The All-Canadian Awards ‘Gala’ was night in Halifax, and Connor Wood, a 5th year guard from the Carleton Ravens, was named the 2017 U SPORTS Men’s Basketball Player of the Year. He is the 8th Carleton player so honoured over the past 17 seasons. Wood shot over 50% from the floor and from the 3 point line, averaging 19 ppg. Other U SPORTS award winners – Ottawa wing man, Caleb Agada, is the Defensive Player of the Year, while Laurentian guard, Kadre Gray, accepted the Dr. Peter Mullins Trophy as Rookie of the Year. Carleton’s Dave Smart won his 8th Stu Aberdeen Memorial Trophy as Coach of the Year, and Dalhousie forward Kashrell Lawrence, won the Ken Shields Award for Academics and Community Service. Conor Morgan, UBC, 4th , Victoria, B.C. Javon Masters, UNB , 4th, Kitchener, Ont. The U of L roster has more returning players than almost any team in Canada West, and 5 of those are 5th years, including their superb guard combo of Jared Baker and Rob Olsen. Rob Olsen is a hot-shooting 5th year guard for U of L.
Forward Brandon Brine is a potential all-star at forward, and Coach Hansen is happy with the progress of 2nd year players Zac Overwater and Josh Sparkes, “They made a big jump over the summer, and are now stronger and more skilled.” Also, the addition of (former UL star) Alex Fletcher as a full-time Assistant will be big for player development. Hansen cites a new push at Lethbridge to provide resources for Athletics, and Fletcher’s post is one example. The late summer signing of import point guard Dejon Burdeaux will spark the guard corps, and ACAC College transfers Chris Maughan and Brian Preneslo give some help up front. Lethbridge may fly under the radar as they integrate the new talent, but they have enough experience and capable leadership in their veterans to contend. The Golden Bears will be in a re-building mode after losing mainstays Joel Friesen, Ken Otieno, and Youssef Ouahrig. Coach Barnaby Craddock, who has had success at Brandon, Fraser Valley, and Alberta as the head man, can see an effective forward line developing, especially with the often-spectacular play of 3rd year Canada West All-Star, Mamadou Gueye, and the physical ’14-’15 rookie star, Sebastian Denault. Add in the experienced Rav Dhaliwal, ‘BIG’ Brett Roughead, and red-shirt rookie, Brody Clark, and this should be a formidable group. Forward, Mamadou Gueye, will be a major force for the Bears. Guard play will be ‘a work in progress’, according to Craddock. “Losing a lead guard as good as Ouahrig will have us scrambling for the first part of the season”, he says. Both import Colby Jackson and Ontario star, D’Wan Williams come with impressive credentials, and veteran Ethan Dixon may get a chance to shine. Andriy Halushko and Lyndon Annetts are both capable outside shooters, and they may help U of A’s back-court step up as the season progresses. Losing 4 of their 5 first pre-season games has to be concerning for Coach Craddock, but there is too much talent there to count out the perennial contenders this early in the ‘re-construction phase’. The GBs are home for their own Invitational on Oct. 23-24 vs UNBC and Queen’s. 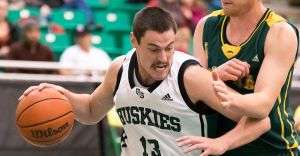 Josh Mayorga (TRU) was on the Canada West All-Rookie team last March, but the young man informed Wolf Pack Coach Scott Clark that he did not want to continue with school and basketball this year. In a similar vein, Adonis Monfort-Palomino, after a rookie year as back-up to Jarred Ogungbemi-Jackson at Calgary, has recently chosen to leave the team, but UC still has 2nd year Cory Hauck, rookie Torrez McCoy, and transfer David Kapinga up to the challenge at that spot . ‘Parity’ is a word being tossed about by some Canada West coaches as we approach the 2015-16 season, while Coach Dan Vanhooren is feeling carefully optimistic about the Dinos’ chances. “We like our team. We are deeper everywhere, and have a nice mixture of experience and young talent”, said Vanhooren. UC lost 5th years, Jarred Ogungbemi-Jackson and Phil Barndt, but have returnees Josh Owen-Thomas, Matt Letkeman, Dallas Karch, and Jasdeep Gill in either their 4th or 5th years at UC. But, perhaps the most striking difference in the playing roster is the emergence of a group of former ‘lesser-lights’ who have developed into potentially major contributors. The post trio of Mitch Ligertwood, Connor Foreman, and Matt Ellis give the forward line a fresh new look, with 4th year transfer Sunny Johal also in the mix. At guard, the team has similar depth, with rookie Winnipeg high school star, Torrez McKoy, displaying “ … uncommon poise and leadership for a young point guard”, says Vanhooren. Jhony Verrone, Corey Hauck, and David Kapinga are all itching to make their mark as well. Last year’s CW Rookie of the Year, Lars Schleuter, brings a dangerous outside threat, and import guard, Thomas Cooper, has demonstrated a deft scoring touch and a nose for the ball on the boards. Calgary finishes their pre-season with the CBU Capers Fall Classic in Nova Scotia this weekend, then hosts Winnipeg for the start of League play on Nov. 6/7. Jhony Verrone G 6-0, 3rd, Montreal, Vanier Coll. The Spartans come off their worst season (2-18) in recent memory, and have an experienced U.S. small college coach, Aaron Muhic, working to revitalize the program. It may take a season to have his ideas translate to wins on the court , but he’s hoping that a couple of key veterans can help the cause immediately. Kelvin Smith looks like he will have to carry much of the scoring load, and Jesse Jeffers needs to stay healthy, and be his usual robust self on the boards. Lucas Mannes looks to be a leader in the back-court, with his combo game, and Matt Blackaby seems ready to step up his game with this new opportunity. Vartan Tanielian has a good array of offensive skills, and, as a big guard, can make an impact. The 7-1 Matt Hayashi “ … has a real passion for the game”, says his coach. “Matt works extremely hard every time he’s on the court.” Another notable addition is import is Sebastian Eliason, a strong wing man, who can score inside or out. The ‘biggest point man in Canada West’ has to be import Dean Richey, who has his experience at Spokane Comm. Coll. to help with his formidable task. TWU is 0-4 in the pre-season to date, with games vs Mt. Royal and Evergreen State in Langley next week, then they start League play at Victoria on the 6/7 Nov.
Canada West Game Scores – Sat. and Sun. – at Calgary 80 Mt. Royal 78 – Both coaches empty the bench, as the Dinos have 4 in double figures, including newcomers, David Kapinga with 11 pts./ 7 steals, and Thomas Cooper a double of 11 pts/10 rebs. 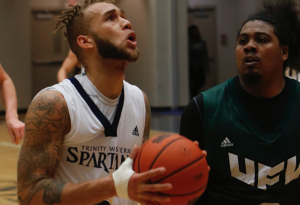 Derrick Wolfe scores 17 and Tyis Yellowhorn 14 for MRU, who also get a double of 11 pts/11 boards from T.T. Thokbuom. Box Score. Rocky Mountain Coll. 81 Lethbridge 65 – Chris Maughan racks up 22 pts /13rebs, Rob Olsen with 20 pts and Will Hickey 19. How happy is Coach Scott Clark at TRU to have the outstanding Ukranian import, Volodymyr Iegorov, show up for grad studies in Kamloops?! The Wolf Pack look like one of the tops in Canada West with him beside Josh Wolfram, and the offense being directed by veteran point man, Reese Pribilsky. The very tall, slender, shot-blocker, Tethloach Thokbuom, played well in both games vs the Calgary Dinos this weekend; Coach Marc Dobell has to be pleased to have more height, with the 6-9 T.T., and 6-8 Brett Layton helping to patrol the paint. The Lethbridge Pronghorns are playing annual games with nearby Montana schools. Coach Mike Hansen has been trying to arrange for CIS schools from Eastern Canada to play pre-season in Lethbridge, but it’s not the cheapest, or most convenient travel schedule, so he has had no takers through this season. Maybe a bigger tournament format in cooperation with Mt. Royal and Calgary ? Speaking of long pre-season trips, we have both the Calgary Dinos and Regina Cougars flying to Halifax, then driving up to Sydney, NS for the Cape Breton Capers Fall Classic, which runs Oct. 22 – 24. 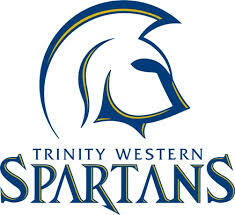 Also down East are the UVic Vikes, who are in S. Ontario for games at Brock, McMaster, and Guelph, Thurs-Fri-Sat. The Canadian ‘World Student Games ‘ Team have qualified for the Quarter-Finals beginning Saturday, as they face Germany. The winner of that game has the tough assignment of facing the USA – Lithuania winner in one semi-final on Sunday. On the other side of the draw, it will be Russia vs Estonia and France vs Brazil. Playing in ‘preliminary round games in Gwangju, S. Korea (we mistakenly said China last weekend), Canada finished at 4-1 following a 106-41 drubbing of Mongolia on Wednesday, and a cold-shooting (33% FG) 68-61 loss to Russia on Thursday. In the Mongolia game, Coach Barnaby Craddock (U of A) rested a couple of his starters, Chris McLaughlin (UVic), and Johnny Berhanemeskel (Ottawa), and got some floor time for some others. Alberta’s Mamadou Gueye played 28 minutes (well above previous games), and scored 23 pts/9 rebs, while Jarred Ogungbemi-Jackson (Dinos) played his regular starting role, but shot more, scoring 16 pts, 7 boards, 6 assists. Two big men, 6-10 Josh Wolfram (Thompson Rivers), and 6-8 Caleb Agada (Ottawa) both snared 10 rebounds, with Agada also registering 8 assists. Against the Russians, it was a different story altogether, as ‘OJ’, McLaughlin, and Agada were limited to 1/13 shooting between them, as only Jordan Baker, 13 pts. 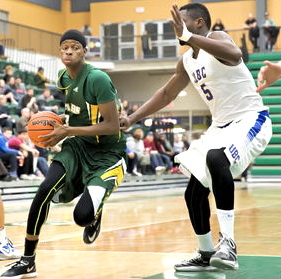 (Alberta), Tommy Nixon (UBC) 13 pts., and Johnny Berhanemeskel (Ottawa) 12 points hit double figures. The Canucks had previously recorded wins over Sweden – 78-61, Mexico- 81-61, and Montenegro 66-63. Canada has had some past success in this ‘World Student Games’ (Now the FISU Games). 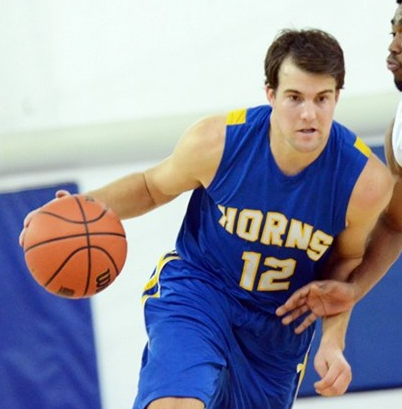 We finished 4th in 2013 in Russia, 2nd in China in 2013, and, with 4 of Coach Ken Shields’ UVic Vikes in the line-up in 1983 in Edmonton, Canada beat the U.S. team which included Charles Barkley, Karl Malone, and Johnny Dawkins. (Credit to the Victoria Times-Colonist). Former Dinos star, Ross Bekkering, has just signed a 1 year contract with Groningen of the Netherlands Basketball League. Ross, a 6-9 post who struggled through an injury -plagued year last Fall and Winter, says, “I’m planning for this to be my last season as a pro, I think. “ His former Dinos teammate, Robbie Sihota, may have decided to stay in Calgary this coming winter, as he starts a search for his post-basketball career.